Early Access, here we come! 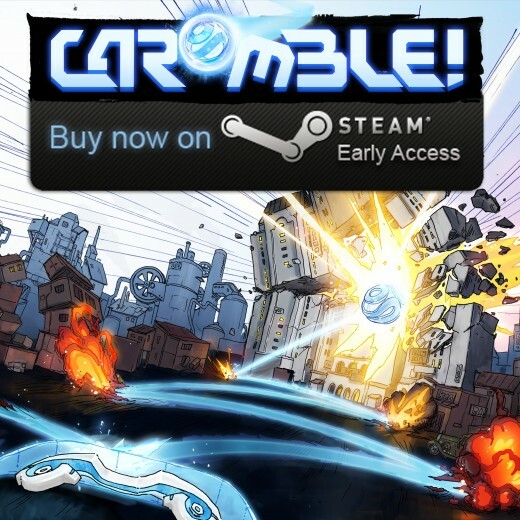 Finally we can proudly announce that after six years of work we’re releasing Caromble! to the public on Early Access! Since the morning we sold a few copies, and one of the first reactions we got was “That game is fun… ALOT of fun”. We even scored a neat Caromble! review already. And the graphics style and physics often get compliments. Good start. Time to celebrate! …a little. Early Access means though that it’s not the full version. It’s for us to ask for help with finding bugs, optimizing the engine and content. It contains the first levels… but every buyer will get the rest step by step as we’re finishing it. Marketing will be one of our next challenges, since we have zero budget. And we notice that it takes a lot of time. But since people really like our explanation videos, it seems we’re learning. So please check it out – and any feedback and share will help us a lot. The most striking difference are probably the graphics. The paddle is different, some better lighting is added and of course, newer textures. Also, we’ve improved some of the feedback to the player: the paddle reacts to its own movement and ball collisions, we’ve added camera shake and there is an effect when a ball hits a wall. Gameplay wise, you can see that the camera is positioned higher in the newer version, which gives a better view of the action. We are working steadily towards the next step in the evolution of Caromble! and expect to bring Caromble! ‘Sapiens’ into your living room in the beginning of 2014. Stay tuned! How to make an awesome trailer? That’s the question. Last Friday we discussed our upcoming trailers. We try to release a new trailer soon! According to Kert Gartner’s helpful blog post there are some important rules of thumb when creating a video game trailer. In my own words those are: entertain, shoot quality footage, tell a story, keep it focussed and short. When I stumble upon a new video game title – for example, on a video game website – I skip the text and I first watch the video game trailer. If the beginning isn’t entertaining I probably move on to the next article. For me, a trailer is THE source of information about a video game and the first seconds are crucial. Of course it’s hard to entertain everybody. But, when the quality and tone don’t match the actual game, it might work against the game. That’s why we concluded that we must take the time to create some quality trailers. In particular because a good, entertaining trailer contributes to letting the world know that Caromble! is a great game! Thankfully, for our next trailers we will get the help of our friend Jasper who happens to have studied Film and Television Studies and who likes to create and edit movies. Although I like pixel art and the pixelate effect we use in our game, it’s expected to have a high resolution trailer with a minimum of 720p. This means capturing insane amounts of raw data on a machine that doesn’t drop frames while recording. Caromble! is not yet finished. We would really like to release a new gameplay trailer soon, because we made a lot of progress since our last trailer in February. However, at this point we can’t capture all the footage we would like to put in our next trailer. In its simplest form this means to structure the trailer. Give it a beginning, a middle and an end. Caromble! has a story which we incline to focus on in our upcoming trailers. However, while brainstorming about our trailers we discovered that the game’s story still has some gaps… So, before storyboarding the trailers we have to finish our writing. This is a general rule in communication and it also applies to video game trailers – and blog posts. When Microsoft’s Kinect was released, I imagined all the cool kind of interactions that were possible and what this could do for gaming. Now a few years later, I haven’t really played any great games that used the Kinect. The only exception would be Child of Eden, which was awesome. I think the main problem was the precision. It feels like 1 out of 5 times the Kinect misinterpreted your actions. Of course this could be poor software implementation and not the hardware, but still. Were motion controls doomed? Now, it is less than one month until the release of the Leap Motion. Instead of full body detection, it does hand and finger recognition. The poor precision that in my opinion degraded the Kinect is not an issue here. It has a precision of 0.01mm with almost no latency (~5ms). I remember that I saw the video about a year ago and I was convinced, with many others, that it was a hoax. That kind of precision was just unreal, especially for the price they aimed to sell it. When the possibility arose to apply for a dev-kit, curious as I am I did not hesitate and filled in the form. A few weeks later, after attending a game jam for Empowerment for Children, I came home finding a package directed to Crimson Owl Studios. This was the first mail we ever received that was directed to Crimson Owl, so that was already special in itself. Even better, it contained the Leap Motion dev-kit. About 15 minutes later I had it plugged it and a demo running… WTF! It wasn’t a hoax. It worked, just as in the video. Wow, nice… It did have some problems with detecting multiple hands simultaneously, but that was solved in later firmware updates. So how to use this for Caromble!? Let’s just try something and first let it detect my finger positions. The SDK is simple and intuitive and comes with a Java binding, so in less than an hour we had something up and running. Moving your finger left and right moves the paddle, simple as that. I was tweaking the parameters to adjust the sensitivity, when I came up with the idea to use my finger position in z-axis direction to influence the sensitivity. That turned out to be a pretty good idea. During gameplay I sometimes used high precision and sometimes high moving speed. The ability to adjust this during gameplay felt really nice. The two other actions we have in Caromble!, charging and activating powerups, have been implemented by directing your finger upward and tapping respectively. This implementation makes it possible to play Caromble! with the Leap Motion as can be seen below and I must say, for me it adds to the fun. Perhaps motion controls for gaming isn’t doomed after all! We will try and find the best way of using the Leap motion to control Caromble!. Perhaps you readers have some ideas of how to use it to charge the paddle or activate powerups? Perhaps we could add a second hand? Possibilities enough. Let us know in the comment section below. Last week was a big week for Caromble!. For the first time since last October we would be showing the game to an audience. And not just any audience. Caromble! would leave the Netherlands for the first time, and travel all the way to EToo London. Doesn’t this make us look like very real and serious game developers? It wasn’t just showing the game though, Pascal and me were set to make our first ever appearance in a live stream. So yes, there were some nerves, but all went well. I always enjoy to be able to explain something that I’m passionate about, so I enjoyed being interviewed together with Pascal about Caromble!. The next day we hooked a laptop to a big TV and had people play Caromble! all day. Collecting feedback from players who never played the game before is very important, and we definitely learned a thing or two about how we can make the game even more fun. It was also a great chance to meet a lot of very nice people from the UK gaming scene. All in all, I think the nicest thing about showing the game on such an event is just watching people play and enjoy it. Having people enjoy and play Caromble! is the whole reason we are making the game after all. Showing the game and talking about it is much fun and very important, but most in all it got me all psyched and eager to work on Caromble! even more. So when I had nothing on my hands on Saturday, I figured it would be a great time to do some development. One of the things I’ve been very eager to improve for quite a while, is what happens every time a ball hits a wall. Since Caromble! is a game, and games are supposed to be fun, all things in the game should be fun. Especially the things that happen all the time. Balls hit walls a lot in Caromble! (sorry I had to write that). We have been trying to make hitting the wall more fun for a while now. Adding nice particles helped a bit, but it never felt quite right. Last Saturday I finally sat down and wrote a shader that should help. The effect is inspired by the helicopter crash from The Matrix. Or maybe just inspired by throwing a rock in a pond. Where the ball collides with a wall, I move bits and pieces of the final rendered image back and forth to make it seem like the whole world is kind of rippling. Maybe I should stop talking and start showing. We are very curious about feedback you may have!! Now I’m off, we have a game to finish! Let’s get ready to Caromble! Using a physics simulation to drive important parts of the game can have some unexpected consequences. Caromble! levels often start small, and the size increases throughout the level. Initially we had the ‘bug’ that at large scales, the physics felt very slow. Almost like buildings would collapse in slow motion. Easily fixed I thought, if the buildings don’t fall fast enough, I’ll just make ‘m really really heavy. Simple! Except that it didn’t work. After a good afternoon blaming the physics engine, I finally sat down and did some thinking. What if we take two imaginary, identical balls, and a 100m tower on a wind-still day. We fill the first ball with lead, and leave the second ball empty. At the exact same time you drop both balls. Now the question is, which one will hit the ground first? Quite unlike I expected, they will hit the ground at the exact same time. Why? Because of Newton of course. The formula for the speed of a falling object (on Earth) is v = gt . So the velocity is the amount of gravity, times the time the object has been falling. The mass of the object doesn’t come into it at all. So to come back to Caromble! Heavy buildings don’t fall any faster than light buildings. But increasing gravity will do the trick. In Caromble! it is possible to charge the paddle and give the ball a boosting power such that it will not bounce off objects, but goes right through them. Adding the charging mechanic would make the gameplay more interesting and gives high-score hunters more possibilities. However, we have been struggling with the implementation. How can we strike the right balance between a powerful powerup and not making the game too easy? In our first implementation, the paddle could be charged in a continuous manner; the more the paddle was charged, the more boosting power the ball would get. If the power was maxed out, we would not only boost the ball, but also give it the ability to crash through objects, instead of bouncing off them. As a trade-off for using this power, we reduced the movement speed of the paddle significantly, making it far more difficult to reach the ball. For some reason, this did not feel right. Blocking the paddle was too annoying, and it seemed impossible to find the right speed for charging. Either players would charge all balls, or none at all. Also it felt a bit gimmicky as it was not needed to complete any levels. To solve this we introduced hitable blocks that could only be destroyed with a charged ball. Now, after several tries, we finally found an implementation for the charge mechanic that feels in place. Instead of boosting the ball proportionally with the amount charged, we only have two possibilities now; the paddle is either fully-charged, or it is not charged at all. Pressing the charge button (LMB or SPACE) fills the charge meter. While charging, the paddle cannot move at all. When the button is released, the meter empties quicker than it was filled. If the ball hits the paddle when the charge meter is not full, nothing happens. However, if the charge meter is full, the paddle is charged, and stays charged until the ball is hit. The charge button can be released, and the paddle can move freely. Having the possibility of aiming the ball whilst being charged, seemed to be the missing piece of having a good charge mechanic. It works and feels good. Now all we need is an awesome graphics effects for charging the paddle and boosting the ball.